We have the highest standards in infection control, cleanliness and sterility. All sterilization procedures and equipment associated with infection control are conducted to strict Australian Association standards. All staff are required to participate in infection control CPD courses annually. In our practice, all used instruments are first hand scrubbed then fed through an ultrasonic bath to remove any surface debris. 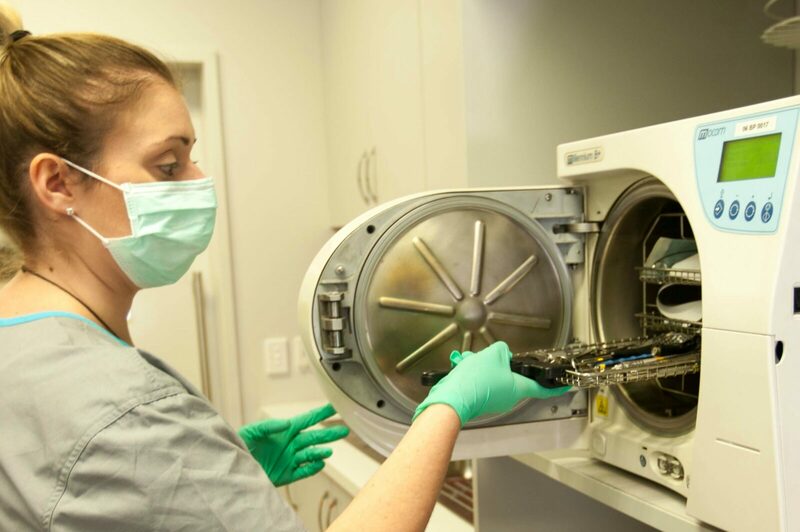 Once that is rendered cleaned on the surface, it is then put through the sterilizer or autoclave. It is Australian standard that cycle must reach 135 degrees for 3 minutes to kill all bacteria and spores. Finally, once the instruments come out of the autoclave, it is immediately transferred to a clean area to cool off. Where people often fall short is they assume that once you purchase these wonderful machines, you never need to check them again. In fact, all of this equipment needs to undergo annual validation and calibration to make sure they are doing their job properly. Furthermore, according to Australian standards, to make sure these machines are working properly, there are daily, weekly and yearly tests that has to be run. Finally, all sterilization cycles have to be recorded in a log even if it has passed so that everything can be tracked. Critical instruments such as tools for dental extraction require a separate log and batch number to be recorded. Whilst all this is extremely time consuming and constitutes a major part of the cost of running a dental practice, it is imperative that it is followed meticulously as it’s the only way that our patients and our family can sit in our chair with peace of mind.